35 The next morning, as agreed, Jonathan went out into the field and took a young boy with him to gather his arrows. 36 “Start running,” he told the boy, “so you can find the arrows as I shoot them.” So the boy ran, and Jonathan shot an arrow beyond him. Daytime, the exact time is unspecified in the Bible text. There is general sunlight from above in this scene. 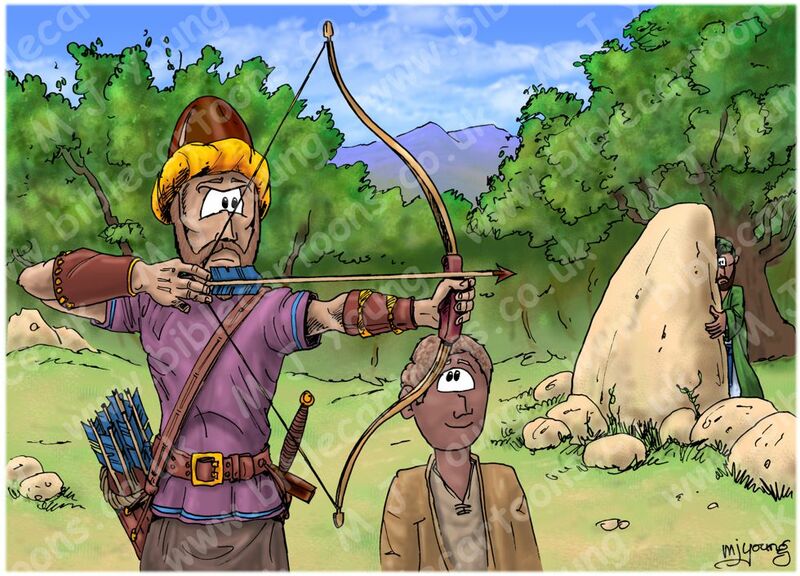 This scene shows Jonathan (the eldest son of King Saul) about to shoot an arrow. You can see the young boy by his side who was tasked with fetching the arrows, & David in hiding, behind the large stone to the right of the scene. The geological map of the area of Gibeah shows the area to be dominated by limestone; I have coloured the rocks in my picture a pale cream yellow colour.